The Olivem® line of ingredients is designed by combining the biocompatibility properties of natural olive chemistry and our technical expertise to deliver superior benefits to formulations. 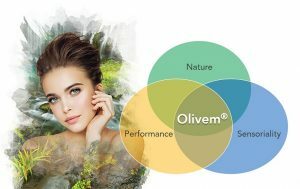 These functional natural ingredients add value to formulations so customers can streamline the ingredients list without compromise on performance.From water soluble emollients and mild surfactants to self-emulsifiers creating liquid crystals structures, the Olivem® line is a complete solution, providing everything skin needs. Olivem® 1000 is a white to ivory waxy flake solid. It is a PEG-free self-emulsifying multifunctional ingredient, HLB 8-9, that is COSMOS-validated. As the sole o/w emulsifier, Olivem® 1000 provides a deep moisturizing effect with excellent spreadability and no soapy effect. The typical use level for Olivem® 1000 is application dependent and between 1.5 and 4%. Olivem® 300 is slightly yellow, water-soluble liquid functional lipid with sebum recovering activities. The recommended use level is application dependent and between 0.5 and 10%. Olivem® 900 is a COSMOS-validated PEG-free co-emulsifier – an ivory waxy solid in flake form with melting range of 65 – 75°C designed for w/o and w/s systems. It improves the dispersion of the inorganic UV filters in sun care and powders in decorative formulations. The typical use level for Olivem® 900 is application dependent and from 1 to 10%. Olivem® 400 is an anionic surfactant, a clear liquid with slight characteristic odor and 36% of active substance concentration. It is recommended in formulations for sensitive skin, baby care, hair care and personal hygiene because it is proven to be able to reduce the final irritation index of the formulation. The typical use levels for Olivem® 400 are 8-18% as the primary surfactant and 1-8% as a secondary surfactant. Olivem® 450 is an anionic surfactant – a clear liquid with slight characteristic odor – designed with 50% of active substance concentration. It is recommended in formulations for sensitive skin, baby care, hair care and personal hygiene because it is proven to be able to reduce the final irritation index of the formulation. The typical use levels are 6-15% as the primary surfactant and 1-6% as a secondary surfactant. Olivem® 460 is a clear liquid anionic surfactant with slight characteristic odor with about 60% of active substance concentration. This technical feature makes Olivem® 460 a preservative-free product. It is recommended in formulations for sensitive skin, baby care, hair care and personal hygiene because it is proven to be able to reduce the final irritation index of the formulation. The typical use levels are 5-12% as the primary surfactant and 1-5% as a secondary surfactant. Olivem® 700 is a stabilizing and structuring agent (a white, waxy solid in flake form at 20°C with a melting range of 60 – 65°C) that works as co-emulsifier, improving the stability of O/W emulsions. It is a versatile sensorial modifier, providing a unique smooth and soft skin after feel. The typical use level is application dependent and from 1 to 5%. Olivem® 800 is a primary o/w emulsifier (white waxy flakes, melting range 55 – 65°C) that may be used to form hyperfluid emulsions. It has an easy-to-use, fine texture appeal, dermatological compatibility and low formulation cost. Typical uses levels are application dependent and between 1.5 and 4%. Olivem® VS Feel is a co-emulsifier, structuring, viscosity building, and stabilizing agent for o/w systems, and sensorial modifier. It is supplied as ivory flakes, melting range 45 – 55°C, and meets COSMOS requirements. Olivem® LV Flex is a very versatile oil-in-water (o/w) primary emulsifier specifically designed for light, hyperfluid and sprayable emulsions while ensuring a pleasant skin feel. It is able to emulsify a wide range of oils and shows good compatibility with various rheology modifiers over a wide pH range.